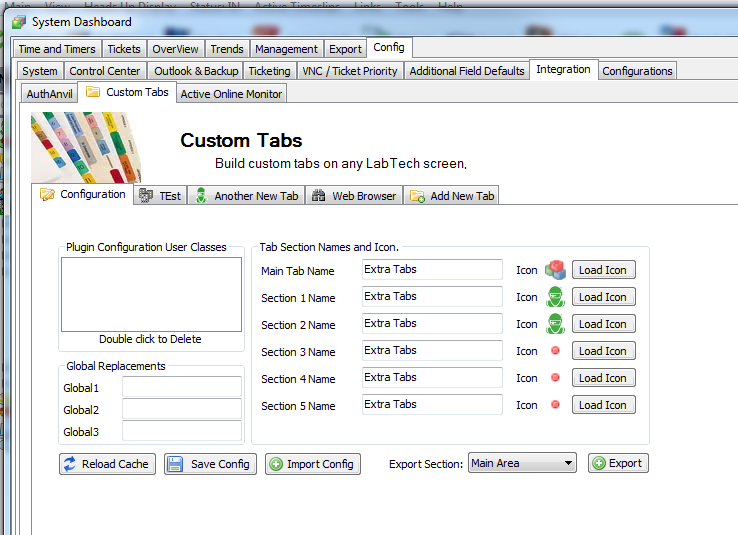 The CustomTabs plugin will allow you to add new tabs to most of labtechs screens. It can add multiple Tabs of information, webpages and dataviews. •	Webbrowser , EDF, Lists and Dataview Tab Types. •	Replacements available for Parameters and commands. •	Add Multiple Commands to a Tab. •	Commands can be URL, Executable, LTCommand, SQL or LTScripts. •	Tabs Fully Brandable with Icons, Colors, Titles and Pictures. •	Tabs can be exported and shared. •	Permissions on Configurations, Tabs and commands. Its pretty simple but like anything labtech very powerfull. First get it installed, then go to the CustomTabs in the Dashboard integrations. Click Add New Tab and start making a tab, when you are done you click Add New tab at the bottom. At this time the TABS are all reloaded so if you open the item that contains a tab, for example the computer screen, the NEW tab will be displayed. Remember you must REOPEN the item for it to update. Creating a New Tab is easy aswell. you will only really need to pick a few things and be done. You need to Fill in the Tab Text(this is the Text of the new Tab), The Title and SubTitle text, Tab Placement(this is the screen the tab will go to), Tab Type and the Tab types configuration setting. This is It Nothing more is needed. Web Page will show a embedded IE browser. The URL must be supplied. Press F2 to get a list of replacements for any of these values. PostData and headers are RAW input and are passed to the webserver as is. EDF Field List will show the Info tab looking list of EDFs. The EDF List is either a Section Name or a Comma seperated list of EDF Guids. All Edfs must be from the same thing, so if this tab is a on a computer only computer EDFs will be allowed. ALSO this tab will NOT work anywhere that does not already have a INFO tab. Data List is a List view of the columns supplied by a SQL query. The SQL Query is Required and is used to format the list. The First Column of the query will be not shown and used as the ID of the row, it must be a number. The rest of the columns are shown in the list with the column names used exactly as they appear in the SQL. Press F2 to get a list of replacements to use in the SQL. Dataview is a LabTech Dataview. You select the dataview to show and optionaly you enter the additional Where. The additional Where is used to limit the dataview to show only the items you want, an example would be "Clients.ClientID=%ClientID%". You can use the replacements here as well. You do not need to add any commands to a Tab but you can. To add a command clear the command area and enter a Name(displayed to the user), the type, and the parameters. Then click add, the command will enter the list, repeat for as many commands as you want. They will be save when you click SAVE TAB CONFIG. Commands can each have an Icon and Permissions. Permissions determine who can see and use the new button. The Commands are shown in a Tool Strip command bar and this can be set to the top or bottom of the screen, it can also be turned OFF. If the Tab Type is a Data List you can tell the commands to be Menus and they will be right click menus on the list. When in this mode you can access the List Items ID and each column with replacements. All Command parameters accept replacements press F2 to see. Run Command - Runs a Labtech Command, specify the CommandID and the Parameters. Run Script- Queues a Labtech Script, specify the Script GUID and the Parameters. Run Executable - Runs the EXE on the Control Center Computer. Open URL - Navigates to the URL, if this is a WebPage Tab then it uses the control to navigate, if it is not then it uses the builtin labtech browser to navigate. If the Use External is Checked it uses the Default browser on the computer. Anywhere else - Does NOT RUN. Computer Tab - Runs on that computer. Groups Tab - Runs as Computer Script on that Group. NetworkDevice Tab - Runs as Computer Script on the Probe. From List View - Runs on that List Items ID as a computer script. Tabs are seperated into sections and there is 6 sections. If a section has only ONE tab in it then the section is not shown and the tab is placed on the Top Level. If the section has more than one tab in it, then it will show the Section Tab with the section text and Icon and under it all the tabs will be located. If a tab is by itself and the Sort ORder of the Tab is set to 10 then the Section will be shown anyways. Fixed Message when system has not been configured and dbagent needs restarted. Fixed the SQL Replacement type. Script Guid will now work and accept both a GUID or an ID. Script and Commands can now specify the ComputerID. Added new Replacement, $SQL$$selectstatement$ , this will select a value and replace it. Fixed the EDF Height not showing in the Split Type. Extended Size of all parameters to 2048 characters. Added New MultiColumn EDF Tab. Added New Multicolumn EDF tab with a Webpage on it. Added option to WebPage Tab to Show a Address Bar. Installer will now work remotely using http to connect. I guess i screwed the version up and jumped a whole minor version number. Fixed the Dataview and added the Where condition to the Query. Configuration screen checks for tables to exist and warns you when its not there. Added more user variables to the replacements. Here it is Guys. And man its freaking awesome. Use Command Execute and use "Message:" as the Program, It will pop up a messagebox with the arguments replaced with variables, this helps in testing. All the TabData is Preloaded in memory, so changes are not noticed until the plugin reloads its cache. When you save a Tab Configuration it will reload all the tab cache so you can open the item and immediatly see the new tab. EDF Tabs have a section name or comma seperated list a GUIDs to display. Some Picture type can cause the Windows GDI to crash so if you are having problems saving a picture then change its format to png. The Export and Import are simple SQL Files so you can edit them and create larger imports, the import will take multipule tabs and process them correctly, the order of items in this file matters. Awesome stuff Greg! So excited to get this. I'll be implementing tonight along with other changes. Thanks for all the hard work. So I couldn't wait. I installed on my 2012.1...and no dice at all. On my 2013, the integration tab is present, but just a gray screen. Let me know if there is any troubleshooting steps I can do. Thanks. OK, Guys Sorry bout that. Its was compiled for 2013. I recompiled it and it works for 2012 as well. Also It did not create the proper tables. 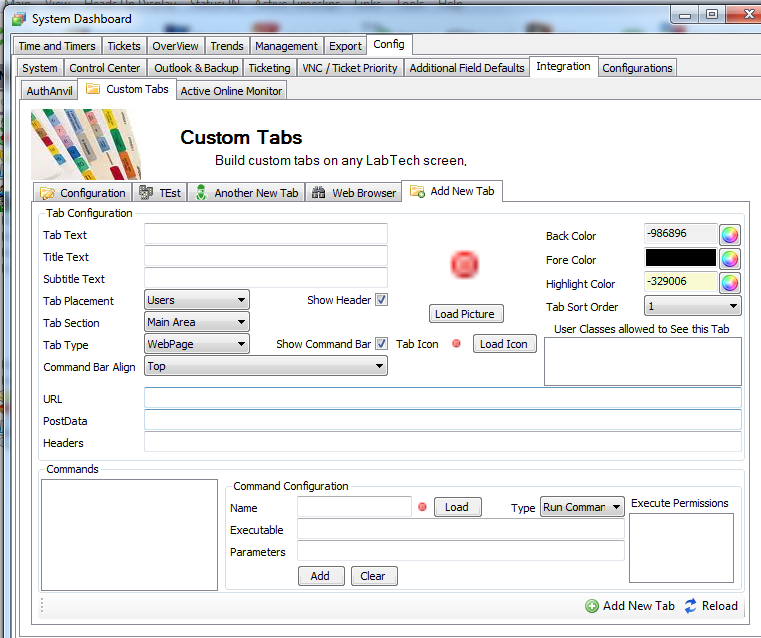 If you enabled it and already got a Plugin_Labtech_CustomTabs table then you will either need to delete them all or add the one thats missing. Man, i am having problems keeping all these plugins straight. Ok the file is working now and is the current updated one. I tested the download to my server and the DLL included is 2012\2013 compatible and installs all 3 tables correctly. Been quite an eventful day for Plugins!! Thank you so much for all your hard work! We all really appreciate it! Added more User variables to replacements. The Export button on the Configuration tab for Export Section does not work. I am able to use the Export Tab on each tab individually without issue though. I'm still figuring out the best way to take advantage of this tool, but liking what I'm seeing so far. you guys can already do this in the plugin. the Replacements are available to all the parameters. so you can use variables as the URLS. So not only can you pass @ID@ but you can do %clientname% and %locationaddress%. Then you can also use the EDFS so if you have a edf on the client called website, the replacement would be %ecwebsite%. PRESS F2 in the URL field, the list will appear, make sure you are on a placement that would have computer\client\location values. ALSO The Export Section is not working yet, will complete soon, You can take a bunch of single tab exports and merge them in one file and the import will work. This plugin will allow you to build bridges and integrations with other apps that are webages, remember you can add commands that call urls and pass replacements. You can GET or POST values to the sites as well. Thanks for the clarification Greg. I was able to resolve this on the Website per client tab. I am however, unable to get Dataviews to be client specific. As an example, I am trying to create a tab that shows offline agents for a specified client using the built in DV called Status/Offline Computers. Whenever I create the tab and specify the dataview, I am also specifying Additional Where arguements and have been unsuccessful. I have tried creating this with multiple dataviews with same results. Any suggestions or is this a bug. Thanks. Ok, II added a Computer Chassis Dataview to the Client Tab. And i Used this as an addtional condition. And it just lists the clients computers. Remember it depends on where you put the Tab on what replacements are available. Also you MUST specify the table name when doing additonal conditions. Thanks Greg. I was able to get the DataView Offline Computers to show computers for the client site only using the Computers.ClientID=@ID@ as you suggested, however, the DataView is actually showing all computers for site, both online and offline. This is not the case when looking at the DataView itself. Do we need to pass additional MySQL statements to dataviews to narrow results when accessing through these custom tabs? Thanks for all your hard work Greg. I appreciate all your efforts and helping me make the most of my LT Deployment. I do have one pimped LT server now. SWEEEET! Adding in the full statement "Computers.ClientID=@ID@ AND Date_add(NOW(),interval -10 minute)>Computers.LastContact" for the additional WHERE did resolve my immediate issue. Thanks. As i said i will get this updated real soon so you do not have to do this. And maybe get the Section Export to work as well. The Plugin is updated and these problems are fixed. Where would I find the documentation on how to use this plugin? Would also be nice to know WHAT tabs ppl are creating! !